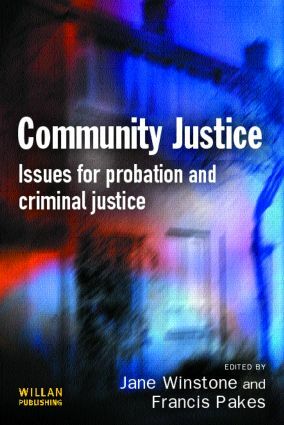 This book provides and accessible text and critical analysis of the concepts and delivery of community justice, a focal point in contemporary criminal justice. The probation service in particular has undergone radical changes in relation to professional training, roles and delivery of services, but now operates within a mosaic of a number of inter-agency initiatives. This book aims to provide a critical appreciation of community justice, its origin and direction, and to engage with debates on the ways in which the trend towards community justice is changing the criminal justice system. At the same time it examines the inter-agency character of intervention and the developing idea of end-to-end offender management, and familiarises the reader with a number of more specialist area, such as hate crime, mental illness, substance abuse, and victims.